Plans are progressing for the multimillion pound flood defences that are key to ensuring that the proposed leisure-led redevelopment scheme can be built on Forge Island in Rotherham town centre. Newly released details show that new 3.75 metre high retaining walls and a new flood gate are required. A terraced amphitheatre and improved canal path are set to enhance the new waterside destination. Muse Developments is Rotherham Council's preferred partner for Forge Island with a proposal that includes a cinema, food and drink outlets and a hotel. 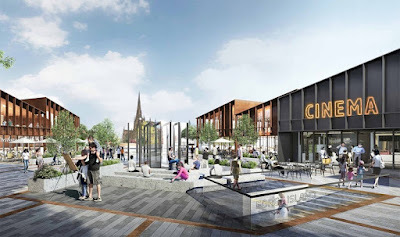 The leisure facilities will be set within an attractive public space and will include a new pedestrian bridge connecting to the rest of the town centre. As reported previously by Rothbiz, Rotherham Council is estimating that it will need to spend £2.5m - £3m on flood defence work before the redevelopment work can commence. Now a planning application has been submitted detailing what measures are required to ensure that the flooding of the site seen in 2007 is not repeated. The plans, drawn up by consultants, Waldeck for Rotherham Council, state: "The proposals comprise of L-Shaped retaining walls aligned approximately 8m adjacent to the western edge of the canal wall and a guillotine flood gate at the entrance of Browns Cut providing flood protection for a 1:100 year plus climate change event. 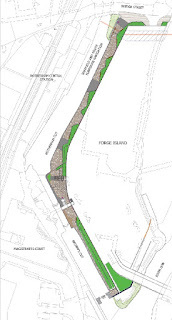 "The flood defence walls will incorporate landscaping along the canal frontage to create a high quality, modern waterside destination for Forge Island." A new concrete L shape flood wall will join with Main Street bridge and a new eight metre wide landscape / pedestrian access along the west side of the site, along the canal, will also be created. A costly plan to raise the entire site was considered but discounted. The £14m first phase of the Rotherham Flood Alleviation Scheme, aimed at reducing flood risk over a 3.5km (two-mile) stretch of the Don from Templeborough to the town centre, saw construction completed in 2008. It was hoped to continue directly into Phase 2 with further European funding but was hit by funding cut backs. The proposal also provides the opportunity to create a high quality modern waterside destination and improve the public realm. Where the existing pedestrian bridge links Forge Island to the Magistrate's Courts site, proposals include the creation of a terraced amphitheatre relating to Rotherham Lock. A separate application has been submitted for a fish pass, enabling fish to travel further up river passing the weir in Rotherham - a relic of the site's industrial past as Rotherham Forge & Rolling Mills. The weir is the one remaining barrier to salmon being able to migrate to spawning grounds in the upper catchment. The alignment of the existing river walls has been shown on maps since 1850 and may be at least 160 years old. Original features associated with the Canal are set to be retained wherever feasible. 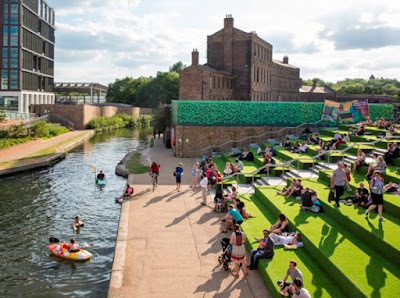 Further details submitted with the application discuss how the new flood defences would look, drawing inspiration from successful waterside regeneration schemes like King's Cross in London (pictured): "The potential for visual intrusion by the solid concrete flood wall is reduced by the dense planting scheme, which will mask this feature; whilst the proposed "amphitheatre" is located in immediate proximity to "Rotherham Lock" providing a viewing platform for activities around this feature. "Corten steel insets will be added to the flood wall, further reducing its visual impact, providing a reference to the areas iron and steel heritage and creating a themed reference to the "Rotherham Red" masonry." If approved, the works will be carried out whilst the existing car park and temporary bus station remain operational. I can't wait for it to begin, the first step to getting our town back from being a dump, hopefully will bring more people into town, then the shops and restaurants will come back.